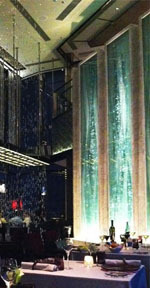 The poor chef at the Ritz Carlton’s Italian eatery Tosca must have been gutted when he first saw his restaurant space. Usually a chef will at least be able to rely on the decor and ambiance of his restaurant to enhance his diners’ experience, and help balance out any glitches in the food. Here at Tosca, the food was going to have to be unfailingly excellent to keep patrons’ eyes and minds off the shockingly awful interior design. Unfortunately, the food was not quite able to stand up to the task. The Space: There is no way you will every forget you are in a hotel restaurant here. It’s a giant hall of a place. The one feature I did like was an absolutely enormous silver chandelier. However, once you see the chandelier you then have to look at the ceiling above it, and you realize that whomever the designer was, they forgot about the ceiling and left it looking like the roof of a conference centre. Sloppy. Interior Design: I am just not eloquent enough to describe the sheer atrociousness of the restaurant interior. 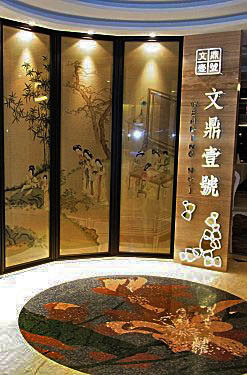 The closest I can get to is that it resembles the absolute worst of China’s super-sized sauna lobbies. Everything is an assault on the eyes. There is not one thread of coherence running through the entire space. 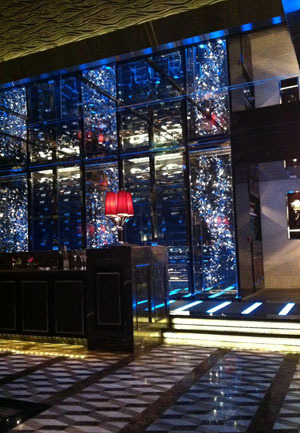 There were blue neon lights, red standard lamps, turquoise glass water features, turquoise glass wall panels, brown marble floors, wooden paneled fascias, fret-work ceiling panels, chromed wine-fridges, black banquettes, red and gold striped chairs, purple glass tableware, spangly reflective ornamentation and grey linen table cloths. The number of different textures, colours and materials used was just mind boggling. Pet Peeve: The seats. There a number of banquettes running the width of the restaurant serving around six tables each. Because they are not attached to the floor and are lightweight, this means that when any of the other people sitting on it tap their feet or push against it in any way, every other dinner has to endure their seat moving too. I spent my entire meal lightly vibrating because the woman sitting on the next table was continually tapping her heel on the floor whilst pushing back into the banquette. Service: Efficient bordering on over-efficient. After ten minutes I had to stop the waiters from topping up our water glasses after every single sip. Also, even though my companion and I were in the full flow of conversation, every time they put a dish down and we’d thanked them for it, and then re-started our conversation, the waitress would proceed to talk over us to introduce the dish – she showed absolutely no discretion in deciding whether it was an appropriate thing to do. If I’m having a tasting menu multiple courses long, then this kind of thing can be useful. When I’ve chosen what I’ve ordered and it amounts to two dishes, I don’t need to reminded what it is as though I have the mind of a goldfish. Just back off. Food: Modern Italian, there was plenty for us to choose from that sounded good. Unfortunately, my starter was rubbish. It was meant to be artichoke velouté with a crispy egg and black truffle shavings. Not one element of it had been seasoned and the whole thing was just a cloying gruel. I suspect that the truffle was either not ripe or old as it had no scent and no flavour. Not a good start. My sea bass main came, and was raw. Don’t get me wrong, I often enjoy fish rare, but literally half the fish was uncooked and stone cold. The replacement fish arrived after my companion had finished his main course, but was very tasty and beautifully cooked when it finally did come. Served on a spring onion fondant and with buffalo mozzarella, it was an unusual combination that I enjoyed. 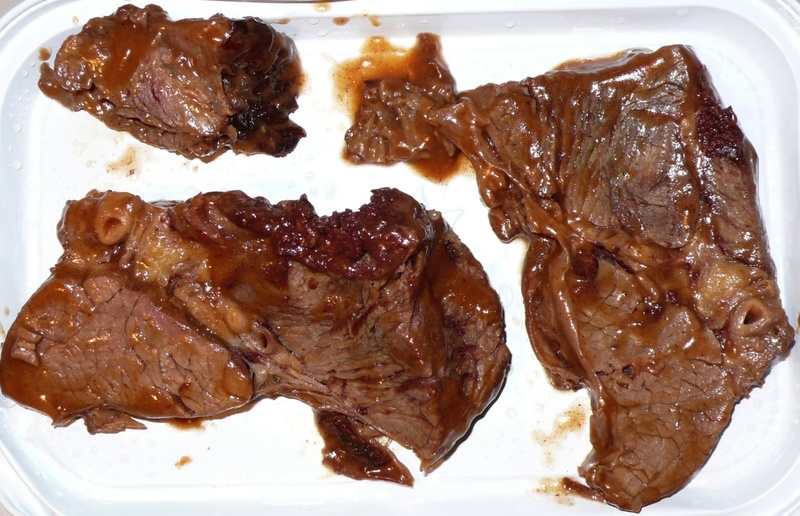 My companion was luckier: he had a tasty onion soup to start and a very good piece of steak for his main. So, unfortunately the food was rather a mixed bag. Drink: There’s a good selection of wine by the glass, and the Sardinian red that my companion had was very good. Price: We paid $1688 for two with the only booze being one glass of wine. I expect those prices in a 5-star hotel, but then I also expect the food to be faultless and the decor to not be channeling Katie Price’s subconscious. Summary: Wild horses wouldn’t drag me back for dinner. Note: I’ve realized from looking at photos on the internet what the issue with the interior is. The design is actually fine in daylight (although those water features are still vile), it’s just at night that everything falls apart. Look at the photo in daylight through the link here and you’ll see what I mean. We found ourselves in Sheung Wan last night and in need of a swift bite to eat. 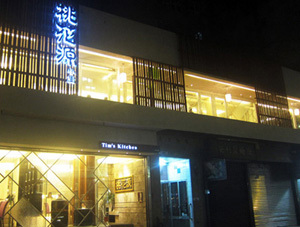 There aren’t a whole lot of quality restaurants down and around Morrison Street, but I have been meaning to go to Tim’s Kitchen for a long while and so Cantonese it was. 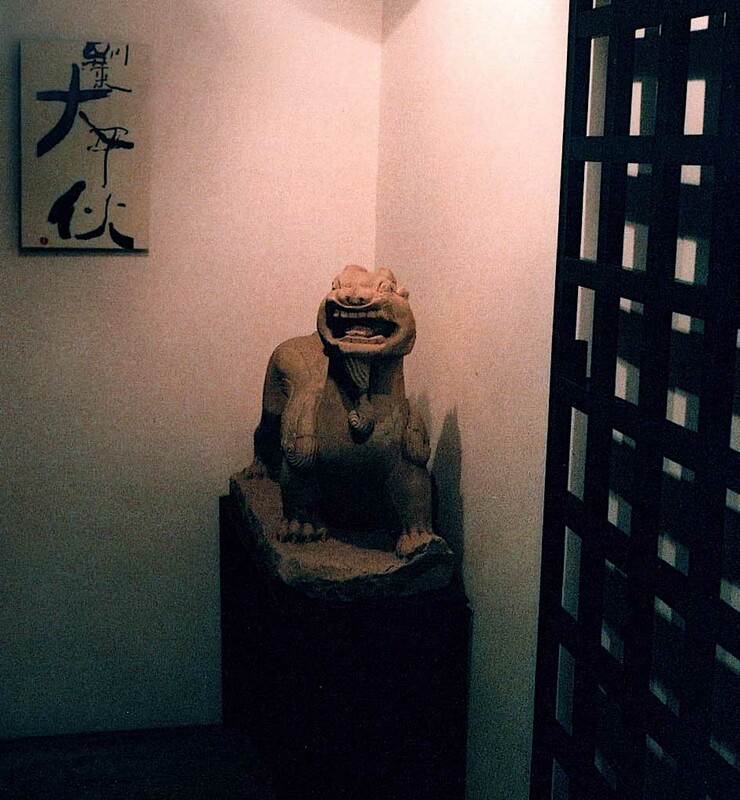 The original restaurant was set up by Chef Lai in 2000 after retiring from Hang Seng Bank where he’d worked for the past 33 years, most of them as their Executive Chef. 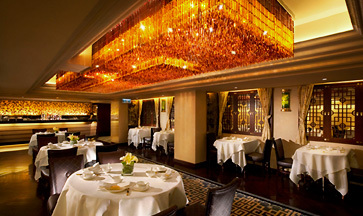 The restaurant has two Michelin stars, and is well known for its authentic and precisely executed Cantonese cuisine. Food: As we were in a rush and it was only the pair of us eating we didn’t have a lot of food, but what we did have was very, very good: stir fried lettuce with soybeans, beef tenderloin with celery, and poached chicken with black mushrooms. The soybeans on the lettuce were like bullets of umami and salty goodness, perfectly complementing the sweet lettuce. The chicken was succulent and tasty, and the mushrooms very meaty which made the chicken seem even more tender. I’m only just learning about 口感 kougan, or “mouth feel” in Chinese cooking, but this dish struck me as one that had been constructed very much with that principe in mind. 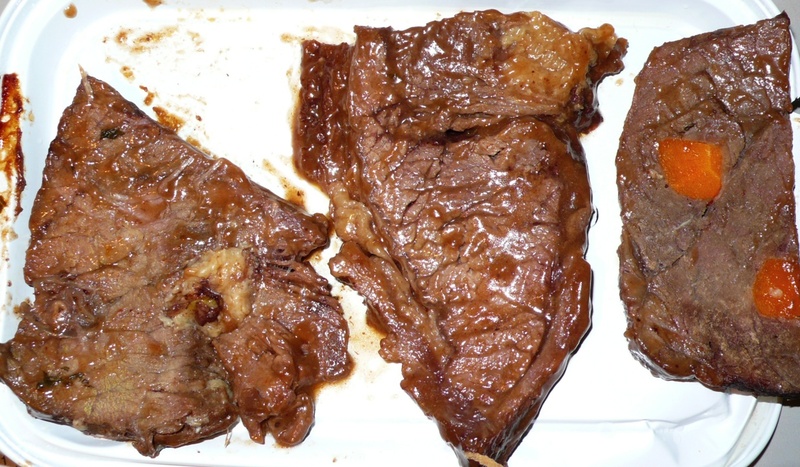 The beef was also tasty, many times you can barely taste the meat because its poor quality, no issue with that here. Drinks: We just had a pot of white peony tea so can’t really go into the drinks menu here. Service: The service was efficient and we appreciated the waiter telling us that the soup only came in gigantic bowls so would be too big for us to share (why they couldn’t serve it in small portions is beyond me, I wish someone would explain this policy to me as I come across it all the time). Ambience: The decor is modern and clean, the chairs comfortable, and you don’t feel that the tables are crammed into the space. Not sure why their napkins are made out of curtain material though. Price: Like a lot of higher-end Cantonese restaurants you can eat cheaply or crazy expensively depending on your menu choices, which is perfect. Those on a lower budget can sample food from a top chef which is simple, and those out to blow a stack of cash can opt for the far more sophisticated fare on offer. Our meal came to HK$257 for three dishes and a pot of tea which was great value. Summary: All in all a good meal, apart from the big problem of Shark’s Fin being on the menu, which is why I have to review the restaurant as Caustic at the moment. Had we had more time to choose our restaurant we would have bypassed Tim’s Kitchen if we’d seen the menu, so unfortunately we won’t be going back until the Shark’s Fin is off it. My problem with shark’s fin is one of sustainability rather than cruelty, because overfishing is a far bigger issue than the finning in my opinion. I admit to being ill informed about the issue, but I’d prefer to be erring on the side of caution. If it transpires that any restaurant serves shark from a sustainable source, then I will be very happy to eat there. L16 Cafe & Bar – Like dining in a public toilet. L16 has an enviable location bang in the middle of Hong Kong Park. You’d have thought that if someone could work out how to keep the mozzies at bay, this would be THE prime location in Admiralty/Central for a proper pukka restaurant/bar – sadly not. I recently went for a late lunch here on a Sunday because I’d been walking through the parks and was hot and bothered. First off I had to move from table to table to find the location that reeked least of toilet (this isn’t a one off, I’ve moved outside before for drinks because of this issue). Really, really unpleasant especially when you realise that the toilets and the kitchen are in one central block in the middle of the room, but I was in need of air-con having to choose between eau de urine or heat-stroke. Food: Thai. Bog standard menu, nothing special, nothing bad, middle of the road cheap fare. Ambience: They rely totally on their location and the surrounding greenery to detract from the fact this place is in massively bad repair. Sit outside and you are attacked by mozzies, but other than that it’s a pleasant place to be. Sit inside and you are faced with tatty menus, chipped chairs, tables with the laminate peeling off, stained floors and the underlying bouquet of privvies. Service: We waited a long time for both food and drinks even though there were very few people in the restaurant. Dishes came at very long intervals so you had almost finished one of your mains before the next one appeared, so not great. Cost: It’s reasonably priced considering you are in the centre of the park and the quality of food is decidedly average. You’d be pissed if you had to pay more. Location: Close to the Pacific Place end of Hong Kong Park in Admiralty. This is such a shame. Props that they are making the venue accessible to all pockets in such a popular tourist spot, but come on! 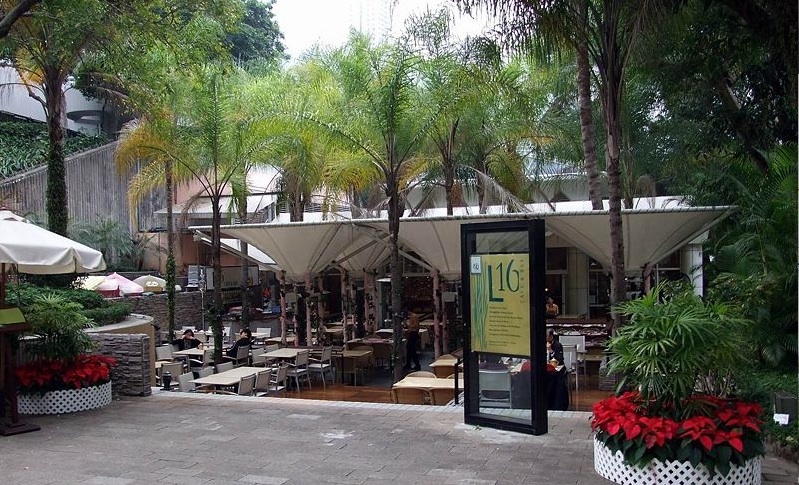 If a place like Nha Trang on Wellington Street in Central and in CC Wu Building on Queen’s Road East, Wanchai can make tasty, interesting, quality food at very reasonable prices, in a smart and clean venue, what is the excuse of these fools in Hong Kong Park? If you have to go, just go for a glass of vino and sit outside, that way you remain oblivious of its massive failings. Bloody dreadful – it needs new management and new vision. Due to a decision to rate any restaurant that serves sharks fin as caustic from now on, Peking Garden changes from SuperCandy to Caustic. Since my favourite Sichuan restaurant closed in Causeway Bay -and it took me two years to find that it had just moved to Central (San Xi Lou) – I always struggled to find a suitable alternative when I’m not in the mood for Canto. 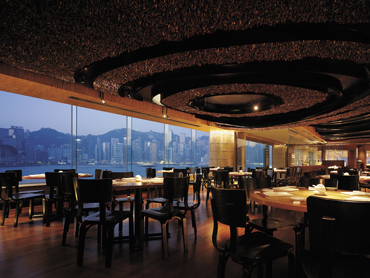 Peking Garden became an interim venue of choice. Embarrassingly it was a friend from visiting from the UK who first suggested we go! It’s a bit more posh that I would usually choose for an everyday supper, but it’s very stylish, well decorated, comfortable and they bring out special chaps to make noodles for entertainment (so thin they can pass through the eye of a darning needle as they like to demonstrate to the oos and ahs of the assembled tourists). Food: Northern Chinese, got some heat and spice in there, serves one of the best Peking ducks in HK (leaves Quanjude spinning in the dust, thank god it’s closed in Wanchai), dan dan noodles, and a great hot and sour soup (in fact all their soups are tip top). Good menu (if you ignore the shark’s fin section). Food is very well executed: clean and crisp. Drinks: Lots of tea options, beers and a pretty extensive wine list (I still haven’t moved off beer with Chinese food). Ambience: It’s actually quite sumptuous. Try and get a table in the main room which is on the left as you walk in, it’s got super high ceilings so coupled with the thick carpets it’s less noisy and the tables are much further apart from the room at the back. Resist the temptation to steal the crockery, it’s really pretty stuff. I like to bring guests to HK here, everyone seems to enjoy it. Price: Good value for such surroundings. The thing about this restaurant is that you can spend as little or as much as you like. We can go in for supper for two and spend $150 a head, or we can go in and spend $400 a head, the price of dishes varies that much – obviously much better with large groups though so you can get loads of dishes. I’ve always wondered why Chinese restaurants don’t serve two different sizes of all dishes so that smaller groups can order more stuff – I’m sure people would end up spending more money. Location: Very convenient, in the basement of Alexandra House on Chater Road. The MTR exit spits you out almost straight into it. Shop B1, Basement 1, Alexandra House, Central. Tel. +852 2526 6456. Open: Lunch and dinner every day. Think there is now a branch in Pacific Place as well if I noted correctly as I ran past the other day. It’s a Maxim’s joint so makes sense for it to be, I think there are 3 or 4 in total around HK. Disappointing juxtaposition here. Great bar, crap restaurant. The venue that houses Face, Lan Na Thai and Hazara it stunning. Beautiful teak housing complex, fishponds, palms, soaring ceilings, nooks, crannies and separate buildings. It’s well hidden behind big gates and a high white wall, so it’s a lovely feeling to discover it and leave bustling Bangkok behind. If you haven’t been to BKK before then you really have to go and have a few drinks at Face, it is really lovely – good cocktails, great surroundings, good service etc. I haven’t tried their Indian food (Hazara), but the Thai food (Lan Na Thai) is very disappointing and expensive for what it is. Far too farang friendly, the heat is completely toned down and just dull, dull dull – don’t bother if you like it fiery. Location: 29 Sukhumvit Road, Soi 38, Bangkok. Tel: 662 713 6048. Very Close to Skytrain station Thong Lo, couple of mins walk.